Beachfront living. 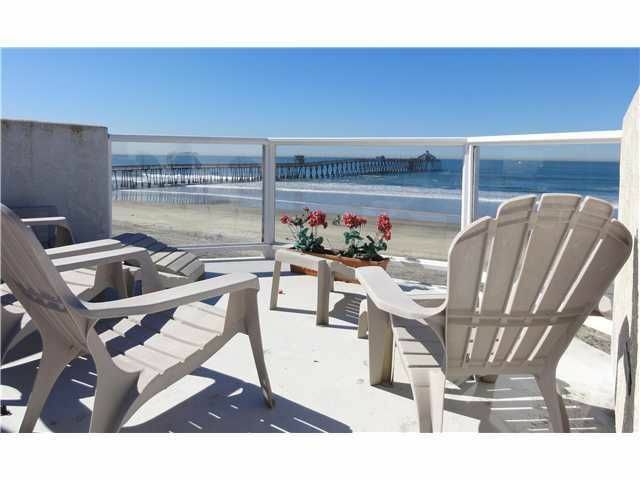 A beautiful home for rent on the sand, a wonderful Imperial Beach location right between the pier and town center. On your next vacation, drive south through Coronado via the bridge, through the palm tree and flower lined streets. Feel the relaxation, the change in ambiance... go further for 5 more minutes along Silver Strand Beach and you will be there--your own vacation house! Why stay in a hotel or condo when you can experience lives of the Rich and Famous? Come and spend your vacation in this free standing executive home on the sand. You will have the vacation of your life, feeling like a millionaire! This beautifully decorated executive home offers 2,800 sq. ft of living space, 4 bedrooms, 4 full bathrooms and a well equipped gourmet kitchen filled with lots of china and cookware for all your family and friends. You will have all the tools at your disposal whether you want to cook for two, a family, or to entertain small groups of friends. Alternatively, if you prefer not to lift a finger during your precious vacation, all the famous restaurants, bars and bistros in near by Coronado and Downtown San Diego are ready and happy to be at your service just minutes away! The great room steps out to a patio with sitting arrangements for dining alfresco next to the sand. All rooms have expansive views of the beach, ocean, and the pier. Beautiful scenes of surfers playing in the waves and children frolicking in the sand are there for you to enjoy. The colorful costumes, the beautiful kites, the sound and the sight of the ocean. The waves, the salty smell, happiness and laughter are everywhere: magnificent, magical and unforgettable. Come and experience our beach house by the sea and you will leave with a lifetime of happy memories. 360 Degrees views from the large rooftop deck to enjoy sunset and sunrise everyday. This is a great house for romantic vacations, weddings, wedding receptions, honeymoon, anniversaries, graduation and birthday parties, girls and guys gathering, multi-generation family vacations, summer vacations or celebrations for any occasion at any time of the year when you want to spoil your love ones, your friends and families. Catering available from JWOK restaurant in East Village. Great food! Check out the good reviews on Yelp. One king bed in master bedroom. 1 Queen bed in rooms #2 and #3. 2 Full bed in room #4. 8 Additional futons for additional guests if needed. Imperial Beach is a great place for swimming, jogging, surfing, tennis, fishing, golf, and many more activities. Contact us to reserve your next vacation getaway!! Fridge wasn't working properly when we arrived but was fixed within hours...Good response to any issues....great spacious home, great location - beach is simply beautiful there - the view is incredible!!! Plenty of amenities nearby...I definitely recommend!!!!!!! We had a great time. The location was perfect, our rental car never left the garage once we arrived. Everything needed is within walking distance. The beach was wonderful. The people in Imperial Beach were so friendly and appreciated our business. Karol was great to work with, she even checked in on us to make sure everything was going well. The house was clean and well kept. The interior and exterior furnishings have definitely seen better days, they are quite worn. The listing said there were beach chairs but the only thing there were molded plastic chairs you could carry to the beach, nothing on any level that you could lounge on. We recently rented this property for a long weekend. Karol from Spirit Realty was great to work with. She made checking in and out easy and convenient. The house itself was in great shape and was large enough to hold four couples and three children. The easy access to the beach was awesome. We couldn't have asked for a better place to stay! My wife Heidi and I stayed with our kids at the property to celebrate our wedding on the beach outside the house on March 31. This place is perfect for large families. Even though there are only 4 bedrooms, they have plenty of room and extra beds. The house is stocked with all the necessities you need. Love the location and the view is amazing. There are always little things you could complain about like the satellite tv being very basic and some beds being a little uncomfortable, but honestly, we loved the place and would stay again. Thank you! We all had a great visit and six night stay at 808 Ocean Lane. The house had pretty much everything we needed. The ladies thought the house could have been cleaner but I didn't have much of a problem with that. I was little disappointed with the 3 foot wall off the patio to the beach. It's too high for 70-80 year olds to go over with the steps but we found by going out the back, we could walk around on the level to the beach. All in all, a very nice visit. Great house for family Thanksgiving get together! Well stocked home! Restaurants and coffee shops within walking distance. Coronado Island , Just minutes away from Imperial Beach. Hornblower San Diego Bay Cruise. Escape from the chaos of the Coronado Village by staying in this beautifully furnished executive home in Imperial Beach Just 10 min away you can have the peace and quiet and still enjoy all the benefits that Coronado has to offer. Beautiful scenery while bicycling through the walking and biking path. Enjoy walking or running on the beach where dolphins are often spotted. Every sport the Ocean has to offer is here or near by. Public tennis courts are available 5 minutes down the road at the public park in Coronado Cays. Surfing,boogie boarding,kite flying,sailing, kayaking, fishing, jet skiing. Scuba diving in La Jolla cove (30 minutes away). Gaslamp district. Catch a game at PETCO park, home of the San Diego Padres. Shop till you drop! in the Coronado village,Horton Plaza, downtown San Diego,Fashion Valley Mall or drive South for 5 minutes to the San Ysidro Outlet center mall. San Diego Zoo,Sea World andBalboa Park with lotsof museums andactivities. Wild Animal Park, Lego Land, Del Mar race track are within 30 minutes of driving. Disneyland about 1.5 hour drive. From $3500 to $5000 per week Rates vary according to time of year and number of guests in the party at $3500 to $5000 per week . Summer Rates $5000 per week Security Deposit required. Cleaning Fee $200 The city of Imperial Beach charges a 10% tax on vacation rentals. Please email for all inquiries . Office phone contact for confirmed reservation holders only.